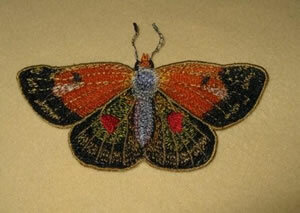 Use this "no sew" bonding material to adhere patches, appliqués and embroideries to most fabrics without stitching! Press N Bond withstands laundering and dry cleaning and will create a permanent bond between fabric surfaces when heat is applied. NO sewing is required! Adheres to Vinyl, Polyester, Cotton, Polycotton and most other fabrics. 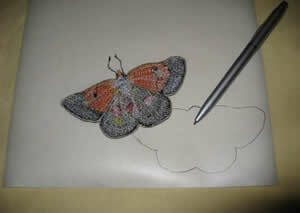 Trace or print the reverse image onto the paper side of Press N Bond. Cut the shape to size. Fuse Press N Bond to the back of the fabric or embroidery. 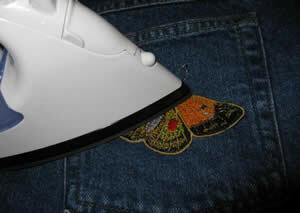 Use an iron temperature of at least 260® (125®) and hold pressure for at least 4 seconds. 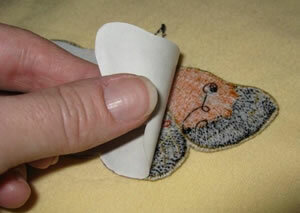 Once cooled, peel back the release paper which will expose the fusible surface. 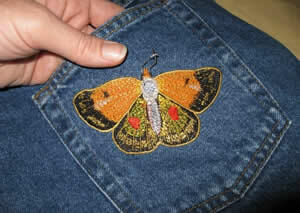 Position the patch/emblem or appliqué on the base material and press from the fabric side. 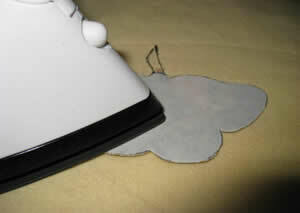 Use the same temperature settings used in step 3 and hold the iron in place for 4 seconds in order to melt the adhesive. *Note: All irons vary in temperature. The temperature given is a base estimate. If you find that you are not getting a good bond, increase your irons temperature until the adhesive melts. **All adhesives will bond more securely to fabrics that do not have sizing or starch applied to the surface. If possible remove these finishes before using Press N Bond. **Press N Bond is not recommended for items/fabrics containing Teflon. Fuse Press N Bond to the back of the fabric or embroidery. Use an iron temperature of at least 260° (125°C) and hold pressure for at least 4 seconds. 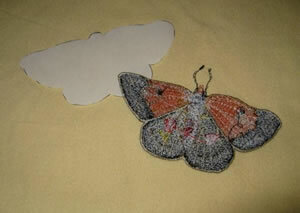 No Sew Applique has ever been easier!